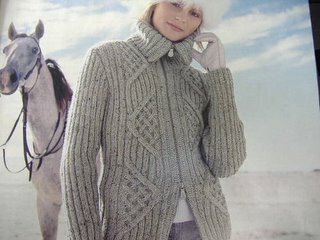 Finnegan Purl Knits: Parlez Vous Francais? Isn't this sweater great? I just love it. It's so me. It is in the new Vogue Knitting. No instructions... just an ad for a yarn company. Of course I had to check out the website. www.bergeredefrance.com. As you might suspect, the website is in French. However, you can go to an English version. The problem is, the pattern book can only be found on the French version which more than likely means you can only get the pattern in French. I have enough trouble figuring them out in English. Drat. No knitting last night. I spent the evening getting my parents set up with their new computer. My mother and father are both 78 years old. Up until a few years ago they were both in excellent health. I won't bore you with details but about 4 years ago, my mother nearly died when dye from a test she had done shut down her kidneys. It took her two years to regain some semblence of normal life. She did time in nursing homes, lots of hospitalizations, etc. only to have another set back and near death again 2 years ago after a surgical procedure. But she's like the energizer bunny... she's doing pretty well again (although dialysis 3 days a week) and my niece thought she needed a computer for Christmas. She had one (a slow, old one) before she got sick and she used to email and instant message all the kids and grandkids. When they moved out of their big house into a small apartment shortly after she got sick, (unfortunate, but necessary under the circumstances) we got rid of the old computer. We recently started a family blog where we all post photos and tell what's going with everyone and my niece felt my parents needed to be a part of it... hence the computer. I set them up with email, some favorite places that they can just click on, and now they're good to go. I sent Cate an email from Grandpap's new email address and she called me last night just so excited that she actually got email from Grandpap. I had to come clean and tell her that he's really not "there" yet. Anyhow, that was my Wednesday evening. I WILL knit tonight. Back to intarsia hell.